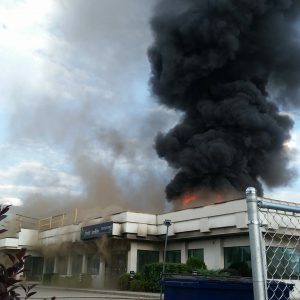 Fire destroys our Surgery Centre! It’s been 2 weeks since a massive fire claimed our Surgery Centre/clinic and we continue to be in awe of the incredible people that live in our community. The Fire happened on the evening of June 30, 2015 and we lost everything. The compassion of the RCMP and Firefighters makes me tear up even now as I write about them. Their devotion to their jobs and the personal concern they showed to us went far beyond the line of duty. That level of caring can not be taught and is a tribute to the valiant men and women we have serving in our wonderful little town. The next two days were grueling as we met with insurance adjusters and faced the reality of our situation but the constant flow of messages and phone calls from friends and those from our business community helped keep us positive and moving forward. These messages via text and social media were a great emotional boost and made us feel that we were not alone. We have been here less than 2 years and in that short time have gotten to know so many great individuals that have helped make our dreams for North Okanagan Foot & Ankle a reality and they were all stepping up to help us again. By Thursday we had our phone lines reconnected; only 2 days following the fire. To our amazement, our voicemail was completely full of sentiments from patients and members of our community. The love and support was overwhelming. We had many reach out and offer to help and others left messages of love and support. There were also multiple local doctor’s who reached out to offer us temporary and permanent space to help keep us in business. We are truly fortunate to have so many doctor’s in our community that truly care. These last two weeks following the fire, we were unprepared for the onslaught of kindness in every aspect of our lives! Many individuals, many of whom we had never met, were doing small acts of kindness that have lifted us and helped us to keep going when we were not sure how we could. From our incredible Staff, to Adelle at the post office and even the cashier at the grocery store, there are so many kind people who have touched our lives for good. We feel fortunate to live in this community and look forward to getting back on our feet so we can “pay it forward” and help build and strengthen this great place. We have a special place here in the Okanagan and are so glad we chose to make this our forever home. Moving to Vernon and starting North Okanagan Foot & Ankle was our best decision yet and we look forward to many more years enjoying this amazing place and making more friends.